Are You Worthy to Join? 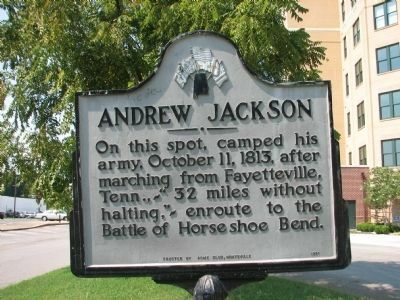 It is believed by at least one Huntsville historian that The Twickenham Beer Drinking and Oratory Society was formed by General Andrew Jackson when he stood on a stump with beer in hand in October of 1813 in route to the Battle of Horeshoe Bend on the site of what is now the home of OTBX and encouraged his men to fight honorably and drink admirably. Although OTBX does not encourage its patrons to fight, honorably or otherwise, they continue the tradition of drinking admirably by offering the best selection of craft beer in the South and thereby following the advice of the seventh President of the United States and carrying on in the truest tradition of the Southern Craft Beer Culture. So join the Club and preach just like “Old Hickory” by wearing OTBX’s Twickenham Beer Club T-shirt and proclaiming from a chest bursting with pride that life is too short to drink bad beer at a dive bar. Don’t delay. Get the shirt today! The Club is an exclusive one. Just slip an OTBX craft beer expert $18.09 and whisper the secret passwords, “Craft beer is da bomb.” The expert will touch his finger to his nose, wink, and slide the shirt across the bar to you. Remember, supplies are limited. When the shirts are gone, they’re gone! (until we order more) Why 18.09? That will be explained to you during the donning of the shirt ritual.